The so-called Digital Transformation is omnipresent and irreversible. It affects all strata of the population and all areas of life. The central term "algorithm" has recently been reduced to a negative connoted interaction between man and machine. Actually, an algorithm is something neutral, a calculation rule that humans have been using for many centuries. 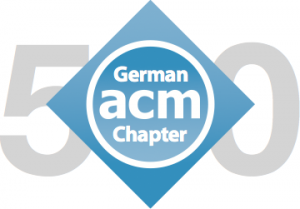 To promote dialogue between algorithm creators - often computer scientists - and users, the German Chapter of the ACM created the Forum Being Human with Algorithms (https://being-human-with-algorithms.org/) on the occasion of its 50th anniversary under the leadership of Marc-Oliver Pahl and Gerhard Schimpf. In addition to professional articles, the forum primarily focuses on people with their personal views on the Digital Transformation. Zur Förderung des Dialogs zwischen den Algorithmen-Schaffenden – oftmals Informatikern - und Anwendern schuf das German Chapter of the ACM anlässlich seines 50-jährigen Bestehens unter Federführung von Marc-Oliver Pahl und Gerhard Schimpf das Forum Mensch-Sein mit Algorithmen (https://menschsein-mit-algorithmen.org/). Neben Fachartikeln kommen dort vor allem Menschen mit ihrer persönlichen Sicht auf die Digitale Transformation zur Sprache. The event started on Thursday in the Alte Aula of the Ruprecht-Karls-Universität Heidelberg with the Turing Award winner Vint Cerf. The co-founder of today's Internet, based on the importance of the Internet for our society, emphasized the need to work even harder on security, stability, openness and accountability. He appealed to politicians to create the necessary incentives. Michael Strube (HITS) opened the afternoon. He mainly spoke about the risks of Natural Language Processing. He traced the tightrope walk on which research in this field is located since many developments can also be abused - for example for targeted opinion steering. Subsequently, Alexander Filipović, media ethicist at the Munich School of Philosophy, discussed the possible roles of philosophy and ethics in the dialogue on the Digital Transformation, in particular by pointing out areas of action for promoting informed decisions. Franziska Böhm (KIT) concluded by explaining the legal perspective. She mainly dealt with the fact that rules are necessary and that algorithms for legal processes are not the saviour of salvation. Moderated by Thomas Matzner, Vint Cerf, Martin Hellmann, Whitfield Diffie, Katharine Jarmul and Jonas Bedford-Strohm (BR) then discussed the effects of the Digital Transformation. An important result of the panel with regard to the work life is that work gives people dignity. With the increasing digitalization of the work life, and the potential loss of jobs, people need worthy jobs to be happy in the future. In addition to further exciting discussions between the participants, the audience witnessed a "Diffie-Hellmann Seat Exchange," based on the Diffie-Hellmann Key Exchange, which is used every day for encrypted website calls. Den Nachmittag eröffnete Michael Strube (HITS), der vor allem über die Risiken von Natural Language Processing sprach. Er zeichnete die Gratwanderung nach, auf der sich Forschung in diesem Bereich befindet, da viele Entwicklungen sich auch missbrauchen lassen - beispielsweise zur gezielten Meinungssteuerung. Anschließend besprach Alexander Filipović, Medienethiker der Hochschule für Philosophie München, die möglichen Rollen von Philosophie und Ethik im Dialog zur Digitalen Transformation insbesondere durch Aufzeigen von Handlungsräumen zur Förderung informierter Entscheidungen. Den Abschluss machte Franziska Böhm (KIT), die die rechtliche Perspektive erläuterte. Sie ging vor allem darauf ein, dass Regeln notwendig sind und Algorithmen für juristische Prozesse nicht der Allheilsbringer sind.